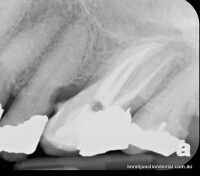 X-rays below show infections in bone coming from infected nerves and variations in root canal anatomy after root canal treatment. 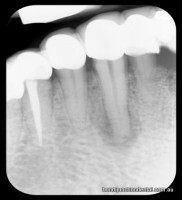 Chronic infections in bone show up as dark on X-rays areas around the end of the roots signifying bone destruction. 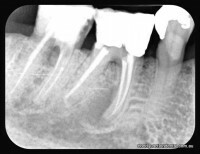 Once treated the bone starts to heal and the bone pattern on X-rays begins to return to normal. It may take at least eight to twelve months before healing changes can be seen on an X-ray. 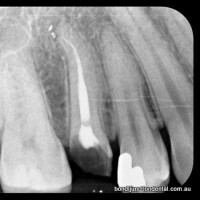 Root filled teeth need to be monitored with follow up X-rays after one year and before placing a crown on the tooth. 1. 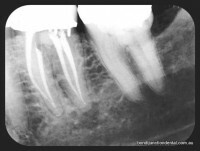 Mechanical cleaning out of the nerve chamber throughout the entire length of the tooth. 2. Locating all nerve canals and shaping the canals to prepare for the filling material. 3. 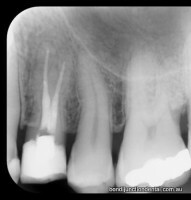 Sterilisation/disinfection of the infected root canal with medicaments. 4. 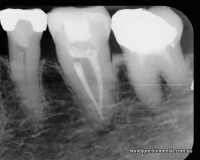 Filling the root canals close to the end of the root. 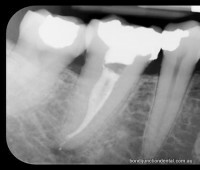 The number of roots and canals vary, usually from one to four, even within the one root depending on the position of the tooth in the arch. Root therapies also vary in difficulty depending on root curvatures, blockages and access. Some nerve treatments require only two half hour visits, others four or more one hour visits. A minimum of three X-rays is required . 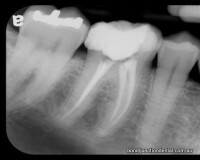 1) Premolar with one root and one canal. 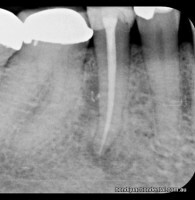 2) Whitish flecks in darker area in bone at mid root level is cement sealing a lateral canal.